Pale, peeling trunks add yet another element of interest to the multi-season features of seven sons tree (Heptacodium miconoides). Deciduous trees and shrubs have a lot to offer in the landscape, with features such as showy blooms, lovely leaves, bright berries, and fabulous fall color. One benefit that’s often overlooked is the beauty of their bark. 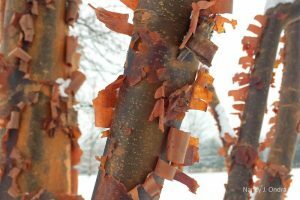 Beyond the typical dark grays and deep browns, bark can add eye-catching color to gardens from late fall to early spring, just when we most need something pretty to look at. Woody plants with exfoliating, or peeling, bark tend to be particularly valuable, because they contribute interesting textural effects as well as striking horizontal or vertical striping on their stems. Some also add the element of movement, as their loose bark strips or peels flutter in the slightest breeze. As seven sons tree (Heptacodium miconioides) matures, the bark develops intriguing rippling as well as even more dramatic vertical striping. Careful placement is the key to getting the most pleasure from peeling bark. The tree or shrub needs to be fairly close by, so you can easily see the stems without going out of your way: near a parking area, perhaps, or next to a path, or outside a ground-level window. Surrounding the base of the tree or shrub with a low ground cover is a great idea, but don’t clutter the space around it with other shrubs that may cover up the beautiful bark. Place paperbark maple (Acer griseum) in a spot where there’s light behind it. The thin peels look bright even on a dreary day. When sun shines through them, the whole tree glows! Think about the background, too. A light-colored background, such as a house wall, makes an ideal backdrop for trees that have darker peeling bark, while lighter trunks tend to show off best against a dark fence or evergreen background. Vibrant green turf works well for showing off pretty much any tree with attractive bark. 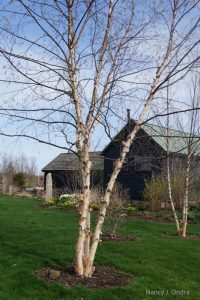 The pale brown trunks of this multi-stemmed river birch (Betula nigra) show up well against the rich green grass and the dark colors of our cottage and office. 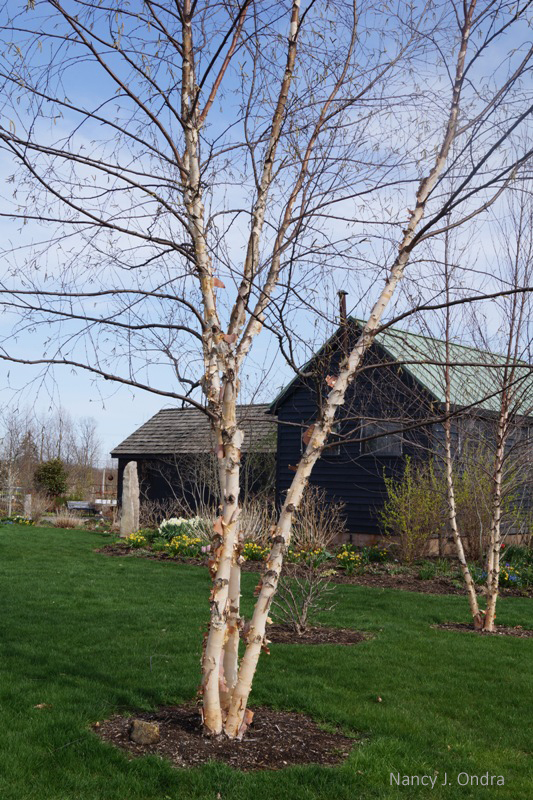 Outstanding deciduous trees with peeling bark that are well suited to our area include paperbark maple (Acer griseum), seven sons tree (Heptacodium miconioides), river birch (Betula nigra), and stewartias (Stewartia spp. ), to name just a few worth searching for. To learn about some lesser-known beauties for bark, join us for our Horticultural Chat Room on Saturday, March 10th, at 10 am. Jerry will talk about some of his favorite finds for this special feature, along with lots of other cutting-edge and out-of-the-ordinary woody and herbaceous gems that are sure to tempt any plant fanatic. Be prepared to add at least a few new things to your wish list for 2018!